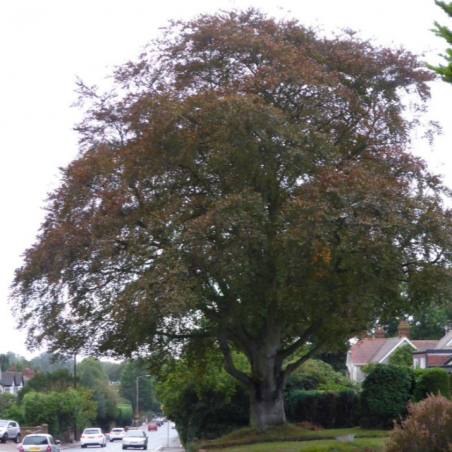 For many years there stood, along the Rayleigh Road (A129) in Thundersley, a noteworthy Copper Beech tree. The new road alongside it was named for it – “Copper Beeches” (though there was in fact just the one tree). It was planted there about the time that Claude Stanley “Stan” Wiggins (founder of the local building empire) self-built his first home on the opposite side of the road in 1908, for himself and his young bride, Lois Anderson. Stan and Lois’s house was called Braemar, a reminder that Lois haled from Scotland. It was here that their three children were born: Cyril in 1910, Joseph a year later and Mary in the year that War broke out. The children walked to Love Lane School in Rayleigh, because the old Church School (which their father had attended) at the top of Church Hill was full to bursting. When the new school was built along Dark Lane in 1923 the children completed their education there. Braemar boasted neither gas nor electricity though water was “on tap” from a faucet in the scullery. By the time the First World War started, our Stan had become a devout Christian and his family attended the old Peculiar People’s Chapel at Rayleigh. Stan registered as a Conscientious Objector and was sent to Dartmoor Prison for the “Duration” where he suffered much deprivation whilst working as an agricultural labourer. It was a very difficult time at Braemar too, for Lois not only lost all the income from Stan’s work as a carpenter and carter, but also had the livestock to manage, plus two aged in-laws (down the road at Kiln Farm Cottages, opposite the Woodmans Arms) and three very young children to worry about. Shortly after the War the Wiggins family sold Braemar and moved next door to Stan’s parents in order to look after them. 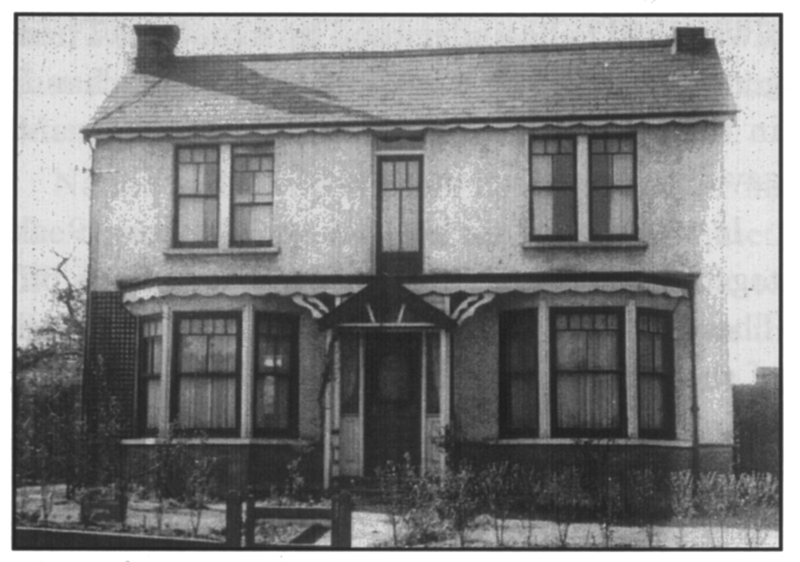 In 1919 Stan bought Kiln Farm Cottages on a 12 acre site which stretched between Common Lane and Hart Road as far as where Woodlow is now. This purchase marked the beginning of his career as a builder and property developer for, on the advice of Albert Upson, he bought old wooden factory units from Pitsea and re-erected them, complete with “tin roofs”, along the Hart Road. 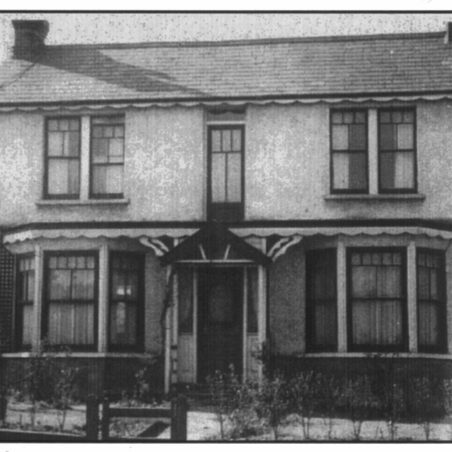 By the close of 1921 he had built a terrace of twelve houses along Common Lane. None of these buildings remain but Braemar still stands (though very much altered) on the north corner of Deerhurst (459 Rayleigh Road). The ancient Copper Beech Tree which stood opposite Braemar (in the elevated front garden of No.1 Copper Beeches) remained as a glorious talisman to the past until Saturday 19th October 2013 when the unfortunate owners were obliged to obtain permission to cut it down after it had been diagnosed as being infected by a root-decaying fungus Meripilus giganteus (common name: giant polypore). 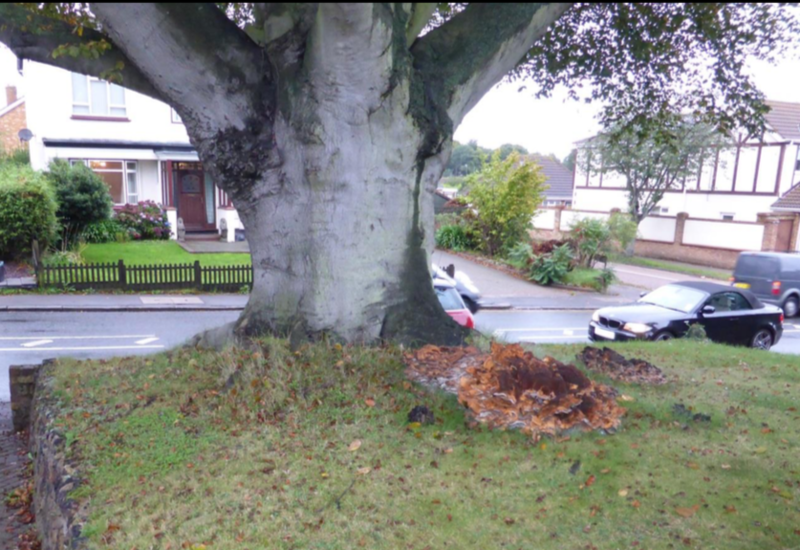 The matter had been investigated by Arbtech Consulting Ltd and its findings arbitrated by the County Tree Officer, who advised CPBC that he concurred with Arbtech’s findings and conclusion. The recommendation was that the tree should be removed and a replacement specimen provided. 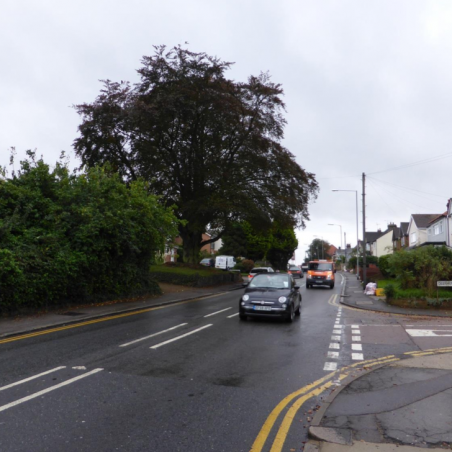 In the circumstances the Council had no choice but to agree to the felling of the tree. 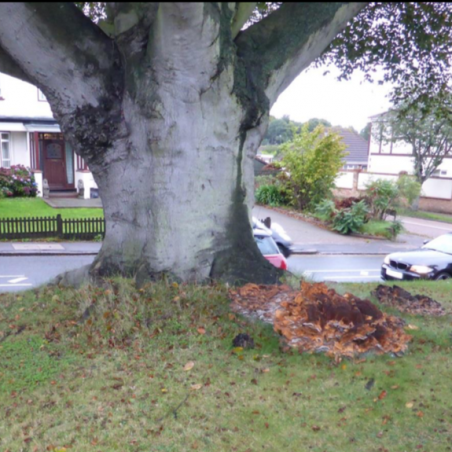 No application for the works was made because it was clear from the report that the tree was dangerous. 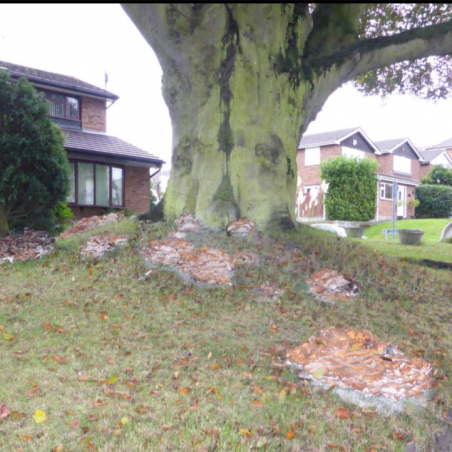 As such the works were exempt from the tree preservation order and the formal consent of the Council was not required. 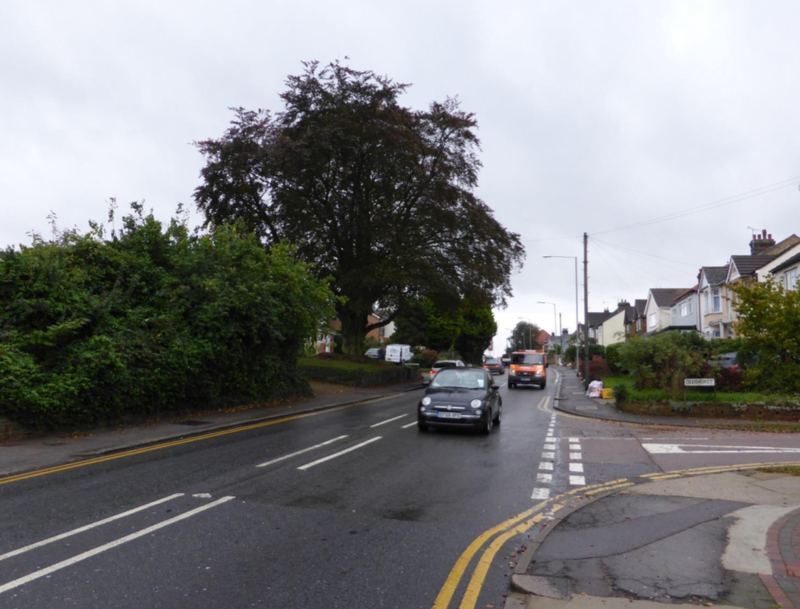 The Council’s Planning Enforcement Officer stated that, “If ignored, the tree could have suffered wind-throw, which given its proximity to the highway was an unacceptable risk to public safety”. A prophetic word! Not only was the traffic along Rayleigh Road at a standstill during the lengthy operation, but there was indeed a veritable outcry. The poor owners must have felt besieged. But, now that the hullabaloo has died down, the Council’s directive to replace the tree with another doesn’t really seem a sensible option. 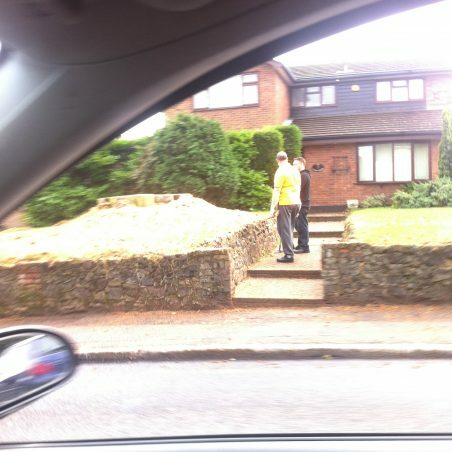 Apart from the small matter of waiting eighty years for it to mature, it would be far too close to the house. Despite their grandeur and amenity value, it must be conceded that big trees are not happy bedfellows with busy roads and buildings. 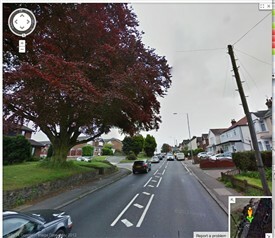 No doubt in a couple of generation’s time, folk might wonder why the side road was named Copper Beeches. With any luck, this wonderful website will provide the answer! I spoke to tree expert Matthew Middle from the Sussex branch of Arbtech Consulting Ltd www.arbtech.co.uk . He was the case officer for the survey. He told me that, based on the diameter of the tree at a height 0.25m, which was 1.35m, the tree’s root system would nominally extend 15m in every direction (requiring 700 sq.m of growing space). 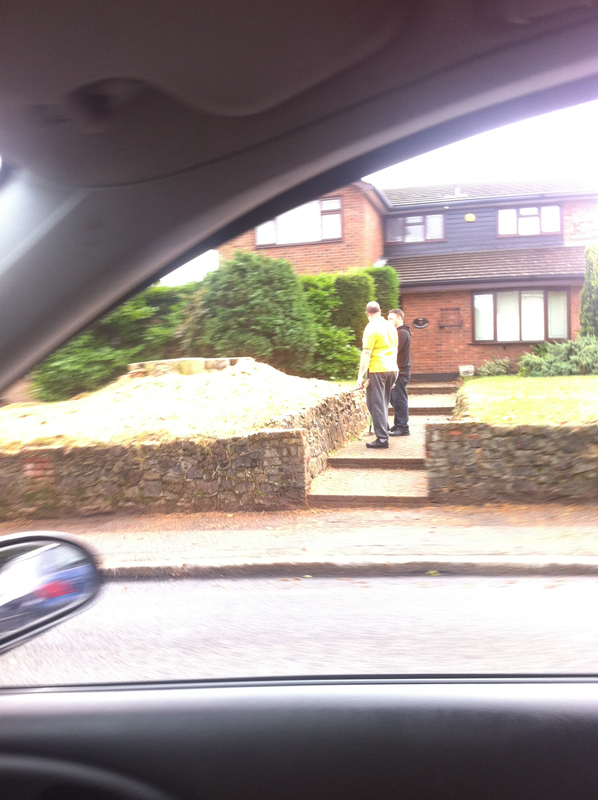 But, because of its cramped location, between house and excavated drive and pathways, it had less than 100 sq.m. When the new house and walls were built, the root system would certainly have been compromised, causing further stress. He was also impressed with the significant amount of fungus present and was in no doubt that the tree posed a real and present danger. Incidentally, the Woodland Trust has a clever auxillary website called Ancient Tree Hunt, where ancient and notable trees can be recorded. 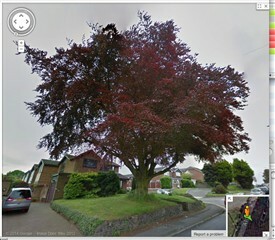 Our Copper Beech has an entry as Tree 14324 and an 8-figure map reference: TQ79968913. Copper beeches first appeared as mutants, independently in different parts of Europe. They were certainly known in Germany before 1488. Nowadays these trees, notable for their purple leaves, are planted extensively in parks and gardens for ornamental purposes. When, or why our specimen was planted is not known, except there are postcards of this stretch of road dated around 1915 which, rather surprisingly, don’t show a large specimen tree, proving that our tree, at the very most, can be little more than a century old. Typically, Beech trees prefer a chalky soil, not clay. Beech has a history of being pollarded for fuel and furniture-making (the timber bends well, has a fine grain and is relatively knot-free). There was evidence to suggest that our tree had been cropped in this way. 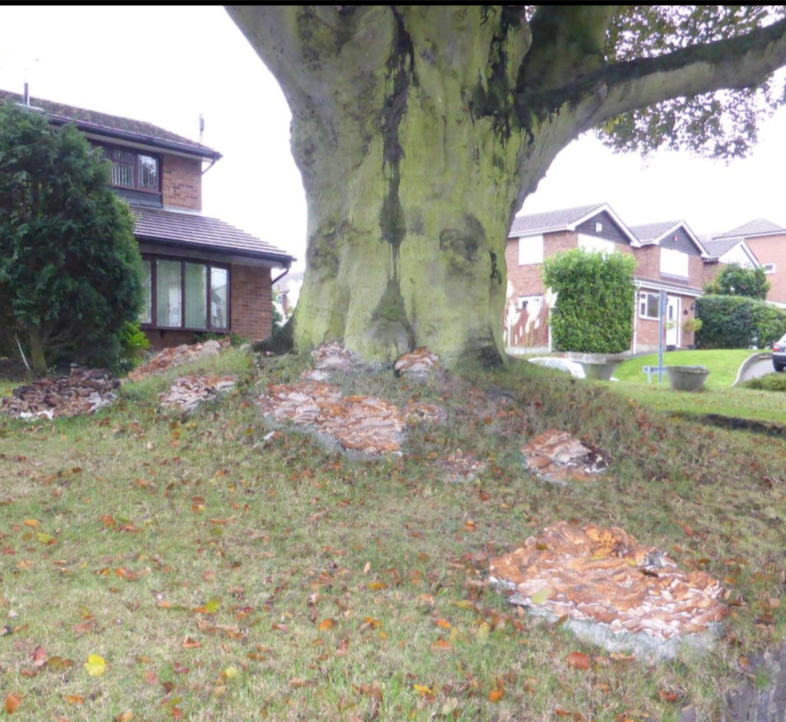 The stump of our copper beech tree was about 1.35m diameter at a height of 0.25m (4.2m circumference). The girth at shoulder height was estimated at 4.5m and the height only about 16m (50ft) – though it struck one as considerably taller. Age? It was probably about 100 years old. 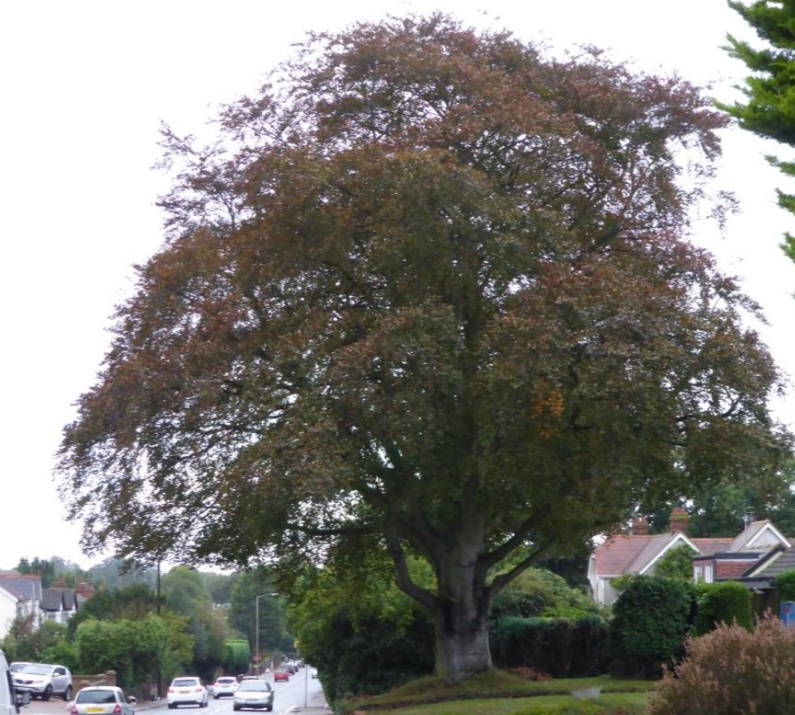 Because of its elevated location, close to the road, this copper beech was a source of wonder and great pleasure for generations of passers by. 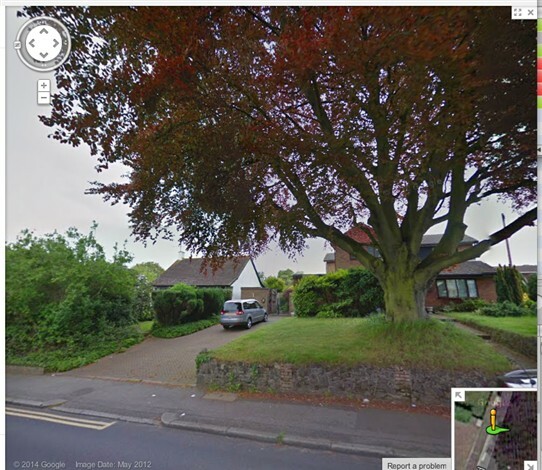 l lived in No 1 Copper Beeches for 16 years and loved this tree. l worked for a lady by the name of Mrs Baker who lived just down the road. 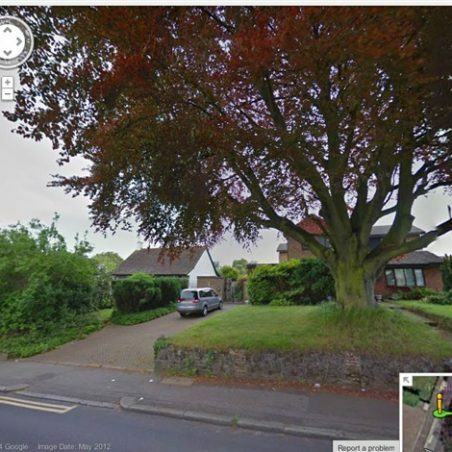 She was the Chauffeur of the man whose house was Copper Beeches when there was only one house there and the pathway to No 1 was the path to the front door of the original house and the rest of Copper Beeches was his garden but that was a very long time ago, l now live in Great Baddow. Found the entire site astounding. Having lived in Mornington Crescent since 1987, I have recently started to develop a profound interest in the history of the area and your site does much to expand my knowledge. However I understand that Mornington Crescent was at one time named Sinclair Road; this information having been given to me by a number of now-deceased neighbours. Can anyone expand upon this, particularly with detail of old maps and buildings?